Spinach dal also known as palak dal is a Indian vegetarian recipe, which can be cooked with chana dal (bengal gram lentil) or even moong dal (yellow lentils). I prefer this recipe with chana dal. This is a very easy to make palak dal, cooked within no time in a pressure cooker. Not to mention this is a healthy spinach recipe. Chop the spinach finely. Heat oil in a pressure cooker, add the ginger and garlic. Saute till turns light brown, then add the onion. Saute till soft and glassy. Add the tomatoes and cook till soft. 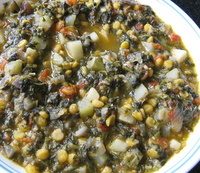 Now add all the chopped spinach, strained chana dal, potato, green chili, salt and 1 cup water. Close the lid and pressure cook until the first whistle. When the pressure subsides, open and check, if need be cook for some more time. In case you don't have a pressure cooker then proceed with the recipe in a large pan with a lid. Cook covered until the dal gets cooked. Serve hot with chapati or rice. Kindly note :- It is important to soak the chana dal in water for a few hours, so that it becomes easier to cook. However if you are using moong dal for this recipe, no need to soak.